I've been hooked with online shopping lately, it's effortless and convenient for me at the same time. Thanks to Lazada because from the time I started shopping at their website, I always get 100% customer satisfaction and if there's a fuss, the problem will be solved immediately. There are so many things and assortments in Lazada's website. From gadgets, appliances, health and beauty products, name it and most likely they have it in a very affordable price. Speaking of beauty, here's a list of beauty must-haves that will make you fab this season! Whether it’s a random night-out or a week away with your bae, make sure that you are selfie-ready and score extra points of getting noticed everywhere you go. This time, you can shop anywhere you are – effortless and risk-free with Lazada.com.ph! Simply download the Lazada mobile app on iOSAppstore or Google Play and you are on your way to find the best beauty deals and get your beauty game on! 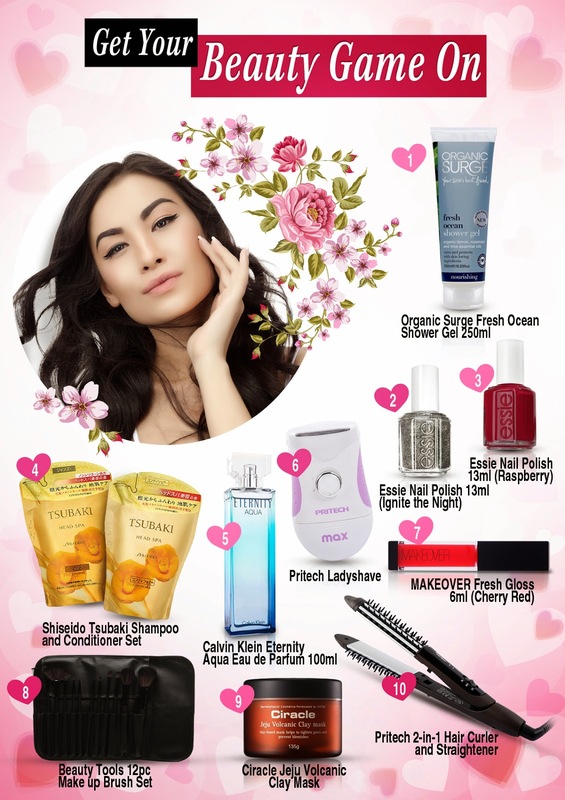 If you are the desktop kind of gal, you can always score these hottest beauty finds simply by logging into www.lazada.com.ph/shop-health-beauty/ Click CONTINUE READING to know more this season's hottest beauty items. 2. Essie Nail Polish 13ml (Ignite the Night) – Add some bling and sparkle into your look with Essie Nail Polish Ignite the Night shade. Perfect for those fun and flirty moments with your chicas! 4. Shiseido Tsubaki Head Spa Shampoo 550ml and Conditioner 550ml Set – Hair is always every woman’s crowning glory and who doesn’t want a shiny and stronger hair right? Nourish your strands with the Shiseido Tsubaki Head Spa Shampoo and Conditioner set and get ahead of the pack simply by having undeniably stronger and healthier hair. 6. Pritech LD-8805 Ladyshave – Get those unwanted hair out of the way and be more confident to conquer the day (and the night) with the Pritech Ladyshave. You can remove unwanted hair easily, quickly and conveniently. Best of all - it operates on two "AA" alkaline batteries so it’s perfect for those girls who are always on the go! 7. Makeover Fresh Gloss 6ml (Cherry Red) – Avoid the hassle of lipstick smudge and smears with Makeover’s Fresh Gloss Cherry Red. Perfect for a glossy, sheer finish and giving your lips a smooth plump effect. You’ll never know who you’ll bump into so a Cherry Red Fresh Gloss from Makeover would be your handy bestie – day in and day out. 8. Beauty Tools Make up Brush Set of 12 (Black) – Look effortlessly stunning simply by applying your make up the best way possible. Packed with Blush Brush, Eye Shadow Applicator, Eye liner Brush, Angled Brow Brush, Concealer Brush, Lip Brush as well as Eyebrow Comb and Brush Combo – you can never go wrong with your make up application the next time. 9. Ciracle Jeju Volcanic Clay Mask – Every girl’s skin needs a good detox, Ciracle Jeju Volcanic Clay Mask contains the rare ingredient Jeju volcanic clay, an ingredient only found in Jeju Island, Korea. Jeju Volcanic Clay Mask contains 6700mg of volcanic ash, known for its ability to cleanse the skin of impurities, leaving your skin the perfect I-woke-up-like-this look. Use this mask to help absorb the sebum in pores and assist various skin problems such as blackheads, blemishes and dry skin. This mask is suitable for all skin types. 10. Pritech TB-909 2-in-1 Hair Curler and Straightener – Whether messy or sleek, prep your mane however you want to without hurting each strand. The Pritech 2-in-1 Hair Curler and Straightener gives your hair the best set without hurting your budget. This sturdy and ergonomically designed hair curler and straightener will surely give you the best look effortlessly.